The Munchkin is famous for its short legs, the result of a recessive gene. The rest of the cat’s body retains normal proportions. Munchkins come in both long and shorthaired varieties, and in almost every color and pattern. Despite their short legs, Munchkins are very mobile cats and can jump onto low tables and couches. They often find their way onto kitchen countertops if they can use smaller furniture to work their way up. Munchkins are outgoing and playful, and enjoy lots of attention. Because of their mixed breeding, they tend to have a greater variety of personality types than many other recognized cats. Even though their legs are short, Munchkins can still jump up on furniture. Longhaired Munchkins need frequent grooming to keep their coats from matting. The breed is steeped in controversy, and many cat fanciers do not believe Munchkins should be bred. The modern version of the Munchkin breed was developed in Louisiana in the 1980s. 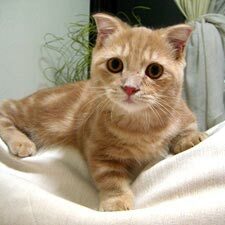 The breed began when a short-legged tomcat named Talouse bred with feral Domestic Shorthairs around the town of Monroe, creating a population of short-legged cat. By the early 1990s, a group of breeders that had become involved with these cats petitioned The International Cat Association (TICA) for recognition of the breed, which they were calling the Munchkin. Amid much controversy, the Munchkin was recognized by TICA in 1995. The Cat Fanciers Association (CFA) and the American Cat Fanciers Association (ACFA) do not accept the Munchkin breed because of the ongoing controversy centering around its abnormally short legs.